With the opening two rounds completed on Dec. 19, the remaining three rounds of the 2018 NWHL Draft were wrapped up the very next day. All five NWHL teams fared quite well with their second day selections. A number of Canadian players were chosen among the second day picks – including an Olympian – while one Swede would be the lone European player selected for the entire draft. That same Swede would also be the only goaltender selected all draft long. Defense was on display in the final three rounds of the 2018 #NWHLDraft, with six defenders and a goalie being selected! The draft order remained based upon the current standings in the league. With the Metropolitan Riveters sitting in last place, they would open the third round of the draft with a topnotch player from an NCAA Division III school. The picks would continue on with selections made the Connecticut Whale, Buffalo Beauts, Minnesota Whitecaps, and Boston Pride, and in that order. It would be hard to say that one team stole the show over the others, as each team garnered decisively talented prospects. Merrimack College was the most widely represented through the final three rounds with three of their players selected. Colgate University would see two of their own go to the Buffalo Beauts. If the third through fifth rounds are considered “the rough”, then certainly some diamonds were indeed found by the five NWHL teams. Here is a breakdown of each team’s selections for the final three rounds. Courtney Wittig (forward), University of Wisconsin-Eau Claire – selected third round, 11th overall. Witting has scored double digits in goals in each of her first three seasons of NCAA Division III hockey. The native of Green Bay, Wisconsin played her freshman season with Marian University where she scored 14 goals in 25 games. After that Wittig has played three straight seasons for the Wisconsin-Eau Claire Blugolds. After seasons of 16 and 15 goals respectively, she already has scored 11 goals through just 12 games of her current senior season. Paige Voight (forward), Merrimack College – selected fourth round, 16th overall. Voight is a 5-foot-7, lefty shooter from St. Michael, Minnesota. She was a member of the USA Women’s U18 squad that took home gold in Buffalo, NY during the IIHF Women’s U18 tournament. Voight set current career highs of 15 goals, 11 assists and 26 points during her sophomore season with Merrimack. Cailey Hutchison (forward), University of Maine – selected fifth round, 21st overall. Hutchison is a native of Hicksville, NY on nearby Long Island. Currently through 19 games in her senior season with the Black Bears, she is on her way to her most productive offensive season yet. Within that stretch Hutchison has tallied three goals and four assists for seven points. Already she has reached her career high for assists. Her current career highs for goals (five) and points (eight) came in a full 38 games last season. Katelyn Rae (forward), Merrimack College – selected third round, 12th overall. Rae scored the very first goal in Merrimack history for women’s hockey. A native of Courtice, Ontario, Canada, the diminutive sniper is a speedster and has proven to be the most deadly scorer in program history. During Rae’s junior season of 2017-18 she amassed 20 goals and 10 assists in just 34 games. If there is a steal of the draft, the Whale getting a player of her caliber in the third round would be it. 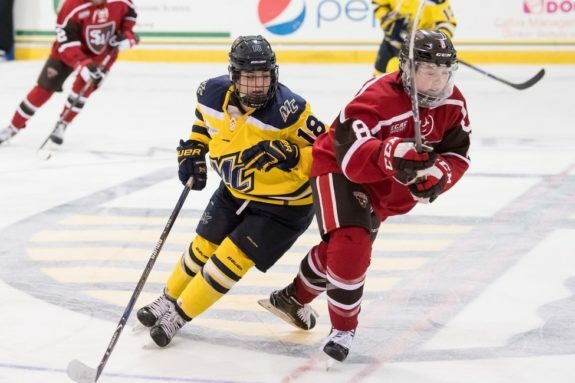 Katelyn Rae scored the first goal in Merrimack history for women’s hockey, and may very well be the best sniper taken in the draft (Photo Credit: James Stankiewicz). Dominique Kremer (defender), Merrimack College – selected fourth round, 17th overall. Kremer is a bullet-shooting blueliner, who like Rae, has been with Merrimack since the beginning. She has posted double digits in points in all but her junior campaign with the Warriors. That being said, during her 2017-18 season Kremer blocked 58 shots in 34 games which was the second most on the team. She is a hustling, bustling defender with good puck movement from the back end. Maggie LaGue (defense), Robert Morris University – selected fifth round, 22nd overall. Standing at 5-foot-8, LaGue is a sizable defender with tremendous passing abilities. In each of her four seasons with Robert Morris she has totaled double digits in both assists and points. Through her first three NCAA seasons, LaGue posted assist numbers of 20, 19 and 22 in no more than 38 games. Last season she became the first defender in RMU history to record at least 50 career assists. Jessie Eldridge (forward), Colgate University – selected third round, 13th overall. The Beauts seem to enjoy going to the well of talent that can be found at Colgate University. A native of Barrie, Ontario, Eldridge is serving as captain of the Red Raiders here in her senior season. Her sophomore, junior and senior campaigns have seen her maintain a level of scoring at a point-per-game average. Last season Eldridge set career highs in goals (22) and points (45). Through 133 career games she has scored 57 goals and 75 assists for 132 points. Olivia Zafuto (defender), Colgate University – selected fourth round, 18th overall. A Western New York native from Niagara Falls, Zafuto is a product of both the Niagara Jr. Purple Eagles and the Nichols School. Like Eldridge and current Beauts rookie Annika Zalewski, she is a Colgate University product too. Zafuto assembled quite an impressive season last year. She set all career highs in games played (41), goals (11), assists (22), points (33), penalty minutes (56) and plus/minus (plus-21). She is representative not only of the Beauts penchant for Red Raiders alums, but also of harvesting homegrown talent. Nicole Schammel (forward), University of Minnesota – selected fifth round, 23rd overall. After transferring from Minnesota State University following her freshman year to become a Golden Gopher, Schammel has scored at a steady clip. Her sophomore season was somewhat mediocre offensively but she completely rebounded last season to set career highs of 17 goals and 32 points in 38 games. Already having 25 points (6G, 19A) in 20 games her senior season, she has already surpassed her career high for assists and may set a new one for points as well. Should Schammel sign with the Beauts, there is a good chance that Buffalo has found a reliable, late-round scorer. Lauren Boyle (defender), Ohio State – selected third round, 14th overall. Though initially a native of Los Gatos, CA, Boyle played her high school hockey with Eden Prairie in Minnesota. With that Minnesota connection and her outstanding work as a Buckeyes defender, it is no wonder that the Whitecaps took her with their third selection. During Boyle’s freshman season of 2015-16, she scored three goals and 14 assists for 17 points in 36 games. Those numbers saw her be named to the 2016 WCHA All-Rookie Team. In her sophomore season, Boyle recorded all three goals in a Nov. 5, 2016 3-0 win over Lindenwood University for the first hat-trick of her NCAA career. Grace Bizal (defender), Boston College – selected fourth round, 19th overall. Bizal is a native of Minnetonka, MN, and previously played as a member of the Jr. Whitecaps before attending college in Boston. She won both a gold and a silver medal while playing for USA’s Women’s U18 teams that competed at the 2014 and 2015 IIHF U18 Women’s World Championships. Through 125 games for the Eagles, Bizal has compiled a plus/minus rating of plus-59. Additionally, she has reached double digits in assists in all four of her NCAA seasons. Karlie Lund (forward), Princeton University – selected fifth round, 24th overall. The accolades for Lund have come pouring in since her freshman season of 2015-16. After she scored 17 goals and 22 assists for 39 points in 33 games, Lund was named the ECAC Rookie of the Year, a member of the ECAC All-Rookie Team, the Ivy League Rookie of the Year, First-Team All-ECAC, and an ECAC finalist for Best Forward of the Year. She has kept a pace of being a career point-per-game player, and has so far amassed 52 goals and 68 assists for 120 points in only 112 games for Princeton. Definitely a superb late-round selection by the Whitecaps – Lund’s hometown team. Emily Clark (forward), Wisconsin – selected third round, 15th overall. Clark is a native of Saskatoon, Saskatchewan, and represented Canada most recently at the 2018 PyeongChang Winter Games. During five tournament games in South Korea she scored a goal for Team Canada. Additionally, Clark has represented her country at three different IIHF Women’s World Championships and two IIHF Women’s U18 tournaments. In the process she has won one Olympic silver, three Women’s Worlds silvers, and two U18 gold medals. Clark’s sophomore and junior seasons at Wisconsin have seen her score 45 and 46 points in 38 and 39 games respectively. Playing currently as a redshirt senior for the Badgers, she is better than a point-per-game player for her career – 62 goals and 69 assists for 131 points in 126 games. Lovisa Selander (goaltender), Rensselaer Polytechnic Institute (RPI) – selected fourth round, 20th overall. This 22-year-old goalie from Sollentuna, Sweden has superb size at 5-foot-11 and over 150 pounds. In addition to her four straight seasons with RPI, Selander played as a teenager in Sweden’s SDHL (Svenska damhockeyligan) – the top women’s league in her homeland, and which many feel is an even more challenging league than the NWHL. She currently sits with the finest numbers yet of her NCAA career – a 1.94 goals-against average and a .944 save percentage in 16 games for RPI. Selander has never posted more than a 2.78 GAA or lower than a .917 SV% in her four NCAA seasons. Jenna Rheault (defender), University of New Hampshire – selected fifth round, 25th overall. Through her first three seasons with the Wildcats, Rheault blocked no less than 50 shots. Although not necessarily known for her scoring from the back end, she is an earnest defender who is very responsible in her own end of the rink. Her ruggedness and determination have seen Rheault play in all regular season games through her first three seasons at UNH.